Are we a good match for you? We love photography and we love couples who appreciate the art we create. We have a secret...we are here to help you through your wedding day. Lisa and I are the best photography team in Las Vegas and an actual couple. Challenging multicultural weddings, large families no problem, there is always two of us. Over the years we have seen pretty much everything and we will be there for you. Remember your wedding day is a milestone in your life and we will be there to capture the moments that your children and grandchildren will look at and be amazed. We're very down to earth and will make you and your family feel comfortable so we can get the best photos. We answer our phone, email or text so if you have any question do not hesitate to reach out to us. Leah Garcia - Canvasser recommends Paul's Vegas Photography. Paul and Lisa were absolutely amazing from start to finish. They were super friendly and easy to work with prior to the big day to make sure everything was set up and ready to go. From the moment our limo pulled up to the time we took off they were professional, friendly, funny, caring and all while having an amazing eye for a phenomenal photo. During the ceremony we didn't even notice they were there but the pictures captured everything beautifully. For family shots they managed to get all of us looking at the camera, smiling and eyes open (a huge challenge for us, haha). And driving through Red Rock the shots they got were simply breathtaking. We cannot recommend them enough and are so thankful they were there to capture our big day. Thank you Paul and Lisa!!! 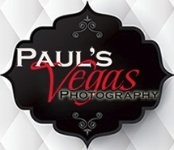 Paul's Vegas Photography is a premier Las Vegas photography company. We capture and create quality images of your Las Vegas wedding or corporate event. When we are at an event we like to have fun! We feel that happy people make capturing your event easier and less stressful. We are Las Vegas Photographers that specialize in wedding photography, corporate event photography and corporate head shots. At Paul's Vegas Photography we come to your event with positive attitude and the flexibility of a true professional. When selecting a Las Vegas photographer it is important to find a photographer with experience and knowledge of conditions, regulations and venues in the Las Vegas area. We capture weddings 365 days a year with over 500 plus weddings since our beginning. Our reviews total more than 200 5 star reviews posted online from our clients. We enjoy capturing beautiful memories, corporate events, trade shows. You can trust that we have the experience that can help you plan your special day to create memories that will last a lifetime. We also offer headshot photography for professionals at our studio, your office, trade show or conference. As professional photographers we have the proper licenses and insurance which will meet the needs of your venue. We at Paul's Vegas Photography look forward to working with you on your Las Vegas wedding or event. Call 702 330-5838. Do not hesitate to call the best Las Vegas photographers for your event. We want to speak with you!